I refused to take it from her (me being the gentleman that I am), but was actually having a full on party in my head. She wouldn’t let me leave her store without it and so I didn’t. As I walked away with my new bowl in hand, I felt an adrenaline rush through my body. I almost tried my new trick at someone else’s store, but then decided not to. I left the market a happy man and excited for next year’s market! Who knows what I’ll get up to there? This roast beetroot salad is the perfect accompaniment to any meal. As the beetroots roast they take on a sweet flavour, which is balanced out by a tangy yogurt dressing. The salad is topped with a homemade sesame and cumin flavoured salt as well as fresh mint. Preheat the oven to 180 degrees Celsius and prepare a large baking dish. Place the roast beetroot ingredients into your prepared baking dish. Mix together and then place into the oven. Leave to bake for 25-30 minutes. Stir the beetroot regularly so that it doesn’t burn. Once the beetroot has cooked all the way through and has become slightly crispy, remove from the oven and leave to one side for the moment. Mix all of your dressing ingredients in a bowl. Leave to one side. Place your cumin seeds and sesame seeds into a pan over a medium to low heat. Stir them until they turn a golden brown colour. Remove from the heat and place into a pestol and mortar together with the see salt. Roughly grind the ingredients together. Place the roast beetroot into your serving dish. Spoon the yogurt dressing over the beetroot and top with the ground topping ingredients and chopped mint. Yesterday evening, I attended what was a family reunion kind of dinner. Relatives from my father’s side of the family came down from the US of A to visit their ‘homeland’. It’s hardly their homeland, they were all born and raised in America but have roots to South Africa. It was quite a large family consisting of 3 children (2 daughters and 1 son all in and around their forties) and a father. The daughters each have a husband and two children of their own. This was the first time that I had seen them in about a decade, not that I remember them. The first and last time we met I was about four years old. It was a reunion of all of my dad’s family and extended family. I hardly remember it at all, but I do remember us going to a hotel which had a swimming pool filled with frogs in most enchanting way. Anyway the point that I’m trying to get across is that after spending a few hours with family members who I didn’t know existed before this week, it feels like I’ve known them forever. We caught up on so much over one dinner. That’s what I love about family. Maybe what it is, is that family is family and when you meet a new family member, you don’t feel the pressure to earn their trust or for them to your trust. You can immediately begin getting closer and sharing your life with them and skip all of that trusting and boundary rubbish which I tend to hold onto (actually this sounds bad coming from me since I constantly tell you about my life without even knowing who you are). They were genuinely some of the nicest most kind-hearted people that I have met in ages. They are so nice that the one daughter, who is a web designer, offered to redesign my blog for me simply because we are family. The food had to have had a lot to do with it. It must have connected us in some way. I brought my Christmas challah loaf along with me to the party. I usually bake for people when I want to impress them. I must admit that a Christmas challah isn’t the most normal thing and takes a while to get your head around. It sort of represents my life, the combination of two religions to make one experience. It’s my normal challah recipe but I added a few flavours that are distinctively Christmas, orange, cinnamon, vanilla, and oh my gosh are they Christmas! I can’t explain the smells that were in my bedroom whilst the dough was rising, all I can say is that it smelled how any good Christmas should. They provide subtle warmth to the flavour of the bread. It could be served with a main meal or as a teatime snack. In a large mixing bowl combine the water, yeast; salt, honey; oil and eggs. Add the flour to this mixture a bit at a time. Mix till dough forms. Turn the dough onto a clean working surface and knead. Knead for about 10 minutes or until you can stretch the dough easily without it breaking. Place the dough in an oiled bowl and leave to rise for 1 hour or until doubled in size. Once the dough has doubled in size place onto a clean working surface. Divide into two equal pieces. For the three-strand plait technique, divide each strand into three equal pieces. Roll each third into a long thin sausage. Plait them together so that you have a long braid. Join the two ends together so that you have a circular loaf. Repeat with the second half of the dough. Place onto a baking tray and lightly cover with plastic wrap. If you’re up for the challenge and would like to attempt a six-strand plait, watch the following video I made for a normal challah. Please note that for this recipe you will need to roll your sausages out a lot longer so that you can create a circular loaf. Once you have your basic challah, join the ends together to make a circular loaf. Leave your plaited challah to rise for 30 minutes. Preheat the oven to 180 degrees Celsius and prepare a nonstick baking tray. Once the challah has doubled in size, brush with the egg yolk. Place in the oven and bake for 40-50 minutes till golden brown and shiny. I am so over exams now. Like seriously, can I move on with my life already? I feel like they have been dragging on for weeks and weeks. Last night I actually woke myself up from a bad dream. I had this dream that I arrived at school and realised that I needed to write a physics exam. In my dream I had a strange feeling that I didn’t know any of the work that was to be covered in the test and so I landed up running around the school frantically looking for answers to equations and formulas. I was late for the exam because I couldn’t find which classroom I was writing in. I didn’t actually get to look at the exam in my dream because I woke up and when I did I could still remember the formulas that my mind had subconsciously made up and was still worried that I would forget them. And then after a few minutes I came to my senses and realised that physics isn’t even one of my subjects at school. It was quite a traumatic dream for me. I’m never that kind of person who leaves studying to the last minutes just before the exam. I usually begin studying weeks in advance and also I’m always the first person to check which class I am writing in so that I can prepare myself mentally. Anyway I have one exam left this Monday, Art theory, and am looking forward to the end of exams. In the meantime, let me lift the spirits and tell you about what I made here. Salmon is very rarely eaten in my home simply because of the price it costs. 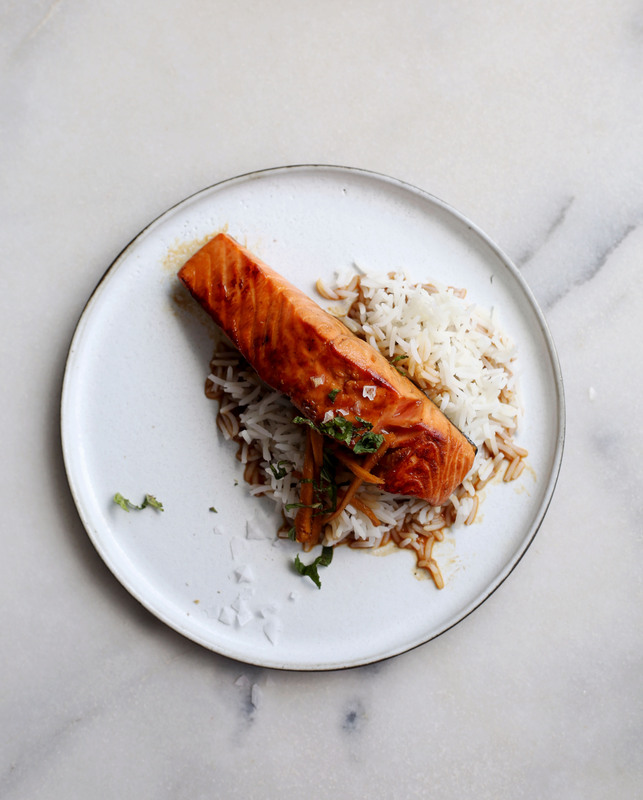 We all love salmon, but just hardly ever get to eat it. Today I went grocery shopping with my mom. I was waiting in the queue with all of our shopping for the week and she was looking for something to cook for dinner. She returned to the queue with a packet of 4 beautiful pink Norwegian salmon fillets. 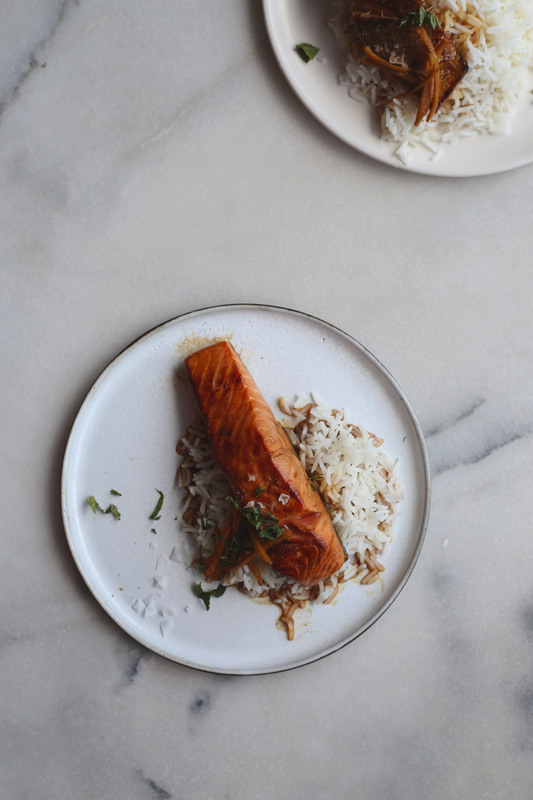 She asked, “What do you think I should make with these”, and I replied, “I’ll cook them!” I turned them into this incredibly tasty salmon on rice dish. The salmon is marinated in a Japanese style sweet and salty sauce made with garlic, ginger, soya and fish sauce, vinegar and a little sugar. 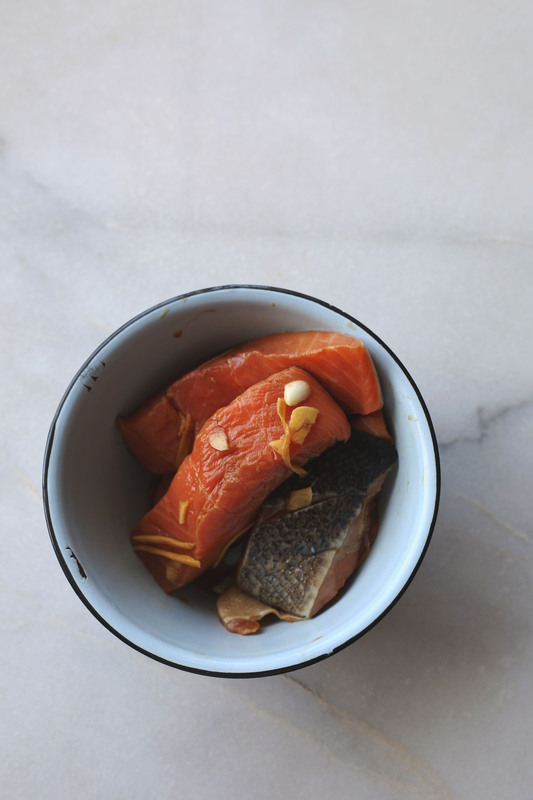 As the salmon marinades in the sauce the meet takes on a sweet and salty flavour. Then they are cooked to crispy perfection and drenched in the reduced marinade sauce. They are super easy to make, yet have an incredibly delicious impact on your taste buds. 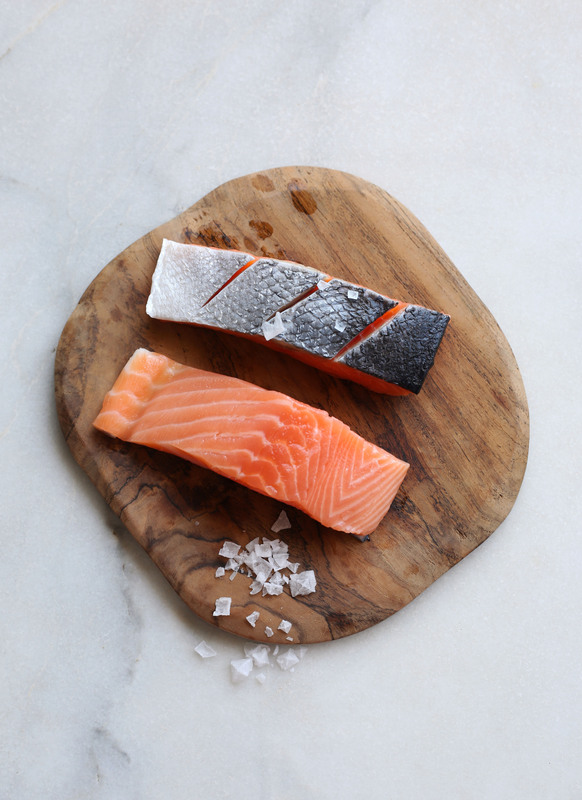 Score the skin of the salmon with a sharp knife three times. This will help the marinade soak into the meat of the fish. In a Ziploc sandwich bag or small container, place the ginger, garlic, fish sauce, vinegar, soya sauce, and sugar. Mix them together. 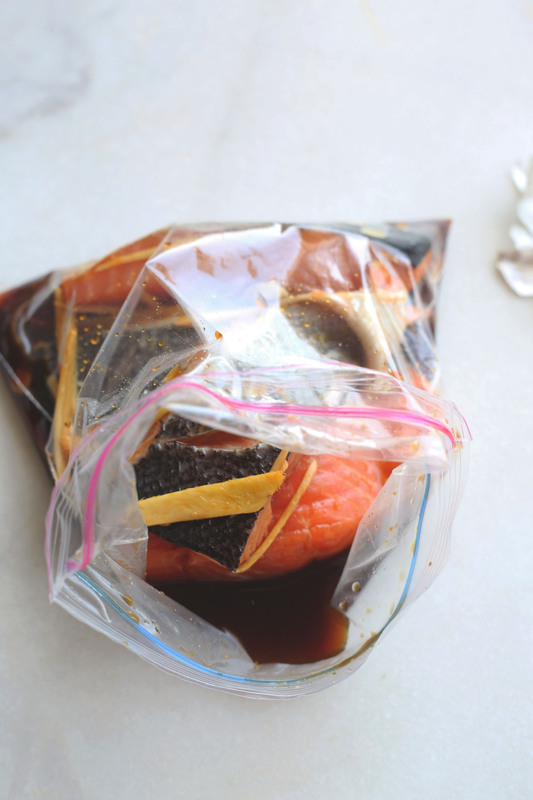 Next, place your salmon fillets into the sandwich bag and shake about. Place into the fridge to marinade for a minimum of 2 hours. Once the fish have marinated, remove from the packet and pour the juices into a saucepan over a medium heat. Bring to the boil and then reduce the heat to a light simmer for about 5 minutes. Warm some oil in a frying pan over a medium heat. Cook the salmon fillets in the pan skin side down first for about 2 minutes, then turn over and cook on the other side further 1 to 2 minutes. Remove from the heat and leave to rest. 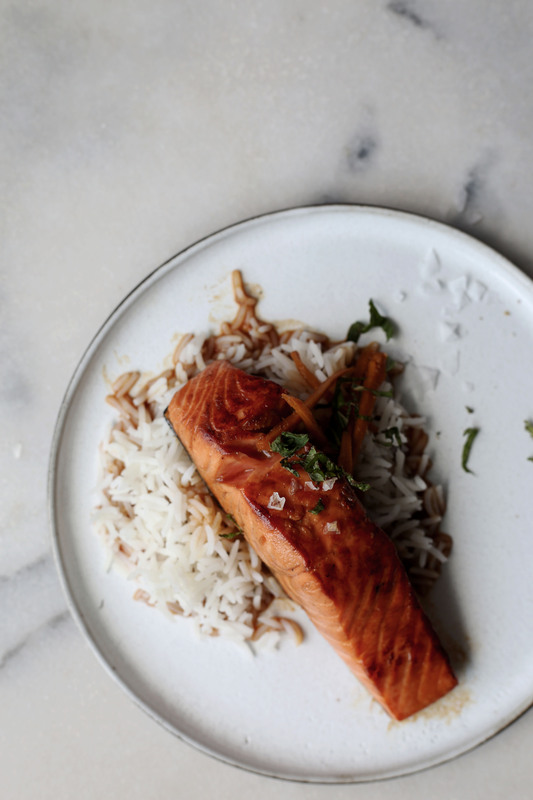 Serve the salmon on a bed of rice and pour the reduced sauce over each dish. Top with some freshly chopped mint for an extra garnish. I’m not studying today; I’m getting into the Christmas spirit. I cannot believe that it’s the best time of year again! Things happened so fast this year. But I am so thankful that we can all finally go on holiday. Christmas has got to be my favourite holiday of all time! There’s just something about how nostalgic (probably my new word of the year!) it is that makes it so great. It brings back so many happy memories of my childhood. I don’t want to be one of those annoying people who tell you about how they had such wonderful childhood filled with happy memories. They sang happily together with their family (in sync of course, because they practiced each song for months in advance). Isn’t life just wonderful! Not that I had a sad childhood, but I would hate to bore you by telling you about it! And not that I had a boring childhood, I just don’t understand the purpose of telling you about it right now. Anyway here’s the reason I love Christmas. I used to love Christmas because all I really wanted were presents and food and Father Christmas and stuff. I didn’t understand the greater meaning of what Christmas is and what it does. It’s simply is a vehicle to bring people together. All previous worries go out the window along with any negativity. Every single family has their own traditions. In my family our Christmas goes something like this. We spend Christmas eve making a Christmassy feast that is eaten on Christmas eve evening. Then in the morning of Christmas, some family member go off to church and the others wait at home. When everyone is together we have the chance to open up presents. This can usually turn into a fight between a few individuals in my family, simply because certain individuals feel the need to be in more control than other individuals. After we sort out who’s going to hand out presents, what order they will be opened, if or if not everyone should watch each person open their present, how many can be opened at a time, what kind of reaction you should have when you open your present, where the wrapping should go, where to keep your present once they’ve been unwrapped, how to climb over mounds of wrapping paper to thank the person who put their time into making presents, we all get a little tired of each other and each person takes a break from the crowd. Let me tell you it is one large family I have. There are seven siblings on my mom’s side, each with their own family, and then there are another two families on my uncle’s side (we stay in my uncle and auntie’s house over Christmas). Thankfully my dad’s side is Jewish and so we can just manage the amount of people. After that we head off to the beach for the remainder of the Christmas day, if the weather is behaving, along with bags and bags of left over’s. I couldn’t ask for anything different because as chaotic as it is, it’s Christmas and it’s family and to me family is the most important thing. So to get myself into the Christmas mood, I decided to pack my schoolbooks away for one day and put my energy into making a Christmas wreath. I was inspired by a picture that I saw somewhere (I can’t quite remember where) of a Christmas wreath, that had a little hook on top of it. It sparked an idea in me to use an old wire clothes hanger to make the frame of my Christmas wreath. I was so so happy that I came up with the idea or that I was inspired to come up with the idea! My only problem was that I don’t hang any of my clothes, they are all folded away neatly in my cupboard. I’ve always dreamed of some day having my very own clothes on a hanger. I knew that my granny has hangers and lots of them, and so I was sure that she would let me borrow it for a good reason like this one. Also I don’t have a Christmas tree kind of tree in my garden, but I knew that there was the perfect one at my school. So yesterday between two exams, my friend and I picked some branches off the school fern tree. And then we went back inside the school to study with a packet full of stolen fern branches. Sure people gave me funny looks as I walked through the school passages, but I knew I was doing it for the right reason. Anyway this was so so so easy to make. It took me about 2 hours to put together, but I’m sure it will take you less time because you don’t have to stop every 5 minutes to take pictures of yourself. I suggest using a fern tree branch as your main wreath and then adding a few flowers for decoration. Make sure that the plants you use dry well because you don’t want a wilted Christmas wreath. That must be one of the saddest things to see when you walk into someone’s home. Hope you enjoy! Bend your wire clothes hanger into the shape of a circle. Don’t worry that you don’t get a perfect circle. Attach the fern beaches to the wire circle in parts onto the wire clothes hanger using string. Tie it tight and give it a double not so that it doesn’t fall apart. Continue tying the branches all the way around the wire circle until you feel that you are happy. Add some flowers to add an extra decorative edge. I started my final grade 11 exams this week, well technically as you are reading this now I will have actually started them last week. They have been quite the challenge so far. Each exam brings new challenges to the table. It’s not that I don’t understand the work; it’s just that I struggle to interpret the questions and answer them as much to the point as possible. Words are not my strong point, and so that’s why I am very lucky that I can communicate through my images. It was so nice to take this Friday afternoon to just simply bake and not worry about anything else. This makes me very excited for my end of year holidays which are coming up quite soon. I seem to have forgotten my love for baking. I guess if you do something over and over again it becomes quite repetitive and boring. What I have realised now is that the special healing powers of baking work best when you are feeling stressed and chaotic. Talk about chaos, I keep on loosing things. But I actually don’t loose them, because I know exactly where they are. It’s more like forgetting things and leaving them behind in strange places. My mind is definitely in way too many places at once. Here’s a fun example, I thought that I had lost my water bottle a few weekends back and caused quite the scene at home blaming my sister for throwing it away. Turns out when I got to school on the Monday it was sitting in my locker quietly waiting for me. So clearly I need a holiday, but for now I’ll just bake some upside down peach cake to represent my upside down life. This is such a sweet (both cute and flavour sweet) cake. On top, sit peach halves, which are soft and squidgy as they baked in the oven under the light load of a sponge cake flavoured with vanilla extract and lemon zest. The cake is topped with a golden syrup made using honey, lemon juice, vanilla extract and a pinch of salt. Each slice is the perfect balance between sweet and tangy. Preheat the oven to 160 degrees Celsius and grease an 18cm round baking tin with a little butter. Sprinkle castor sugar over the base of your cake tin and then arrange your peach halves on top of that. Set to one side for the moment. Cream the butter and sugar in a bowl until light and fluffy. Add in one egg at a time and continue mixing until smooth. Alternately add the flour and milk into the egg and sugar mixture starting and ending with the flour. Add the remainder of the sponge ingredients and continue mixing until a smooth batter forms. Pour the batter over the prepared peaches, in the baking tin, and place into the oven. Leave to bake for 40-50 minutes. By that time it will have risen and formed a golden crust. Poke with a toothpick, if it comes out clean the sponge is cooked all the way through. Remove from the oven and leave to cool completely before removing from the baking tin. Place all of your syrup ingredients into a saucepan over a medium heat. Mix until it comes to a light simmer remove from the heat and pour into a jar. Place the cake upside down onto your serving plate. Spoon the honey syrup over the top of the cake. I made this cheesecake for my design teacher’s, Mr. Ford, farewell party this past week. I’ve been avoiding this post the entire week probably because I don’t really want him to leave us. He is going off on retirement after being a designer, artist and teacher his entire life. He is such an inspirational person and is the true definition of good design, functional and beneficial to society. It’s quite sad that he’s leaving us now. Ask him on any topic, he knows about it. Not in an arrogant way, in a way that he is willing to learn more. In fact he is constantly learning new things and sharing them with us students. It can be a challenge to get his seal of approval, but once you receive it you know that you are on the right track. He is the reason I myself want to be a designer. Of what, I do not know. He has taught me that design is more than just a department, it is an attitude. I painted his dog for him as a little thank you present. Anyways he asked if I would make him a cheesecake for his farewell party, and I did. A normal cheesecake was too ordinary for this kind of an event, so I broke the no nuts at school policy and made him this showstopper of a cheesecake. It’s my Peanut butter chocolate cheesecake! It would be wrong of me to take all the credit for myself; I did get a little help from my best friend Nigella Lawson. This the ultimate decadent cheesecake made with a peanut and chocolate biscuit base filled with smooth peanut butter cheesecake filling and topped with a soft chocolate sauce. A little sprinkle of salted peanuts cover the top to add crunchy texture and balance out the sweetness. The cream cheese filling cuts through a lot of the richness of the peanut butter making it easy to eat spoonfuls and spoonfuls after each other. It can be prepared up to three days in advance. Simply store in the refrigerator. Combine the base ingredients into a food processor and blitz until a dough like mixture forms. Using your fingers spread the base across the bottom and sides of your prepared baking tin. Place in the fridge whilst you make the filling. Place the entire filling ingredients into a large mixing bowl and mix until a smooth mixture forms. Pour into your lined baking tin. 210-Place into the oven and leave to bake for 50 minutes to an hour. By that time the top will have set and formed a slight golden crust. Remove from the oven and leave to cool completely. Place all of the topping ingredients, excluding the salted peanuts into a saucepan over a medium heat. Whisk together until all is smooth and melted. Spoon the topping over the cheesecake. Place to chill in the fridge overnight. Before serving sprinkle with your salted peanuts. Either you’re a crumpet or pancake person. I’m crumpet person. Believe it or not, but I can actually still remember the first time that I ever made crumpets. It was quite a while back, maybe when I was about 10 years old? (not that I’m asking you, I’m just not sure myself). In fact it wasn’t even in this country, South Africa. It was in China, of all places to learn to make crumpets. I had family (my cousins), who lived there for a quite a while. We were lucky enough to visit them three times in Beijing. Those were actually the only times that I have travelled across the borders of my country in my life. I thought that China was an absolutely beautiful country filled with diverse culture and amazing people. I loved how different it was to anything that I knew before that. Anyway my cousins went to an international school, which was also amazing. My one cousin used to attend after school cookery classes as an extra mural (I wish they offered that here!) and when we were there I had the privilege to attend one of her classes. That day we made; you guessed it, crumpets or flapjacks. When the teacher said, “Today we will be making crumpets.” I hade no idea what she was talking about but then soon realised that they are the same thing as your normal flapjacks. Notice, I have chosen to use the word crumpet due to its sounding more sophisticated and it being a word that someone refined, like myself, would say. The reason that I have made them today is because this past week (besides for my exams starting) was my mom’s birthday! She turned a certain age that I’m not sure of myself. She loves crumpets and so I made them for her. She is such an incredibly inspirational person to me and she is way more than just my mom. Without being cheesy or anything, thank you mom for being yourself and for working so hard for all of us. Here is a small token (this is usually what the important more privileged people at my school say to other important guests who visit our school “here is just a small token of our appreciation to you.” It seriously annoys me) of my appreciation to you, a stack of crumpets. These little guys can be whipped up within 10 minutes flat! They are super easy to make, yet the results are surprisingly delightful! This recipe makes for light, crisp crumpets, which are perfect with fresh fruit, syrup and butter. Place all of your ingredients into a bowl and mix until a thick batter forms. Melt a little butter with a drop of oil in a large frying pan over a medium to low heat. Drop spoonfuls of the butter into the frying pan. Once bubbles start to form around the sides of the crumpets, they are ready to flip. This usually takes about 2 minutes. Leave to cook on the other side for a further 2 minutes. Continue the process until all of the batter is used up. Serve warm with fresh fruit, butter and syrup.